I picked some carrots from my garden yesterday as there are plenty. So what to do with them you ask.......many a carrot cake I have tried, but this is the best one ever. Moist, light and the yummiest cream cheese frosting; enjoy! sugar carrot and nuts, then stir in combined eggs and oil. Beat on medium speed with electric mixer for 5 minutes. Pour into prepared pan and bake in moderately slow oven for about 1 hour. Stand for 5 minutes before turning onto wire rack. 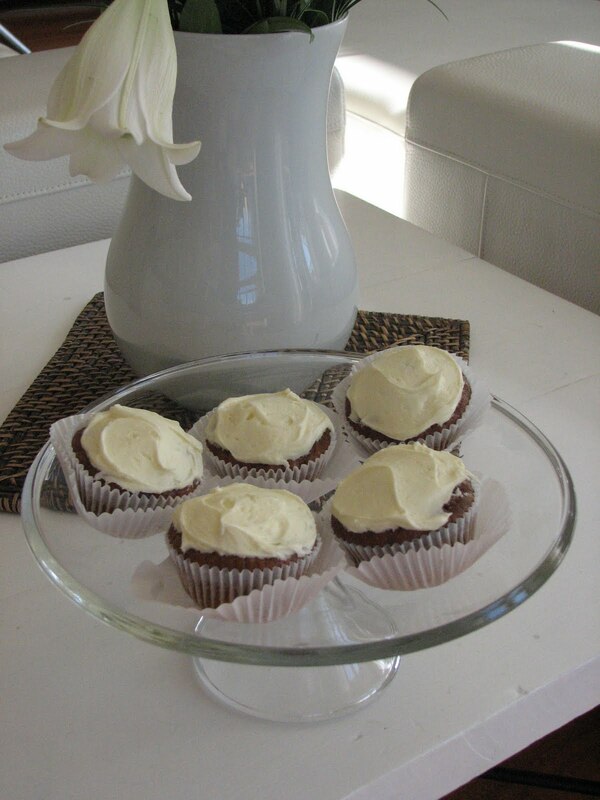 To make frosting ; beat 125grams of cream cheese with 50 grams of butter in electric mixer until smooth. Add 1 teaspoon of lemon rind and 2 cups icing sugar. Blend together and spread onto cooled cake. Tip- I keep my cake in the fridge in an airtight container. It will keep extremely moist this way for a good week. Also I have used this recipe to make muffins ( as in the photo), bake until just firm on the tops.